Western pros - the "hot sticks" - have been quietly mopping up bass on zipper worms the last few years - and have kept their lips zipped tighter than zip-lock bags about them. They are really only now becoming known, stocked by tackle shops, and used in the rest of the country and Canada. Background. The original zipper worm is manufactured by Roboworms. Robotic machines actually pour these baits as if hand-poured and they are super, super soft and tear easily. Also expensive and only able to be manufactured in limited quantities - not enough supply of them to meet demand. A sister company was started, related by ownership, called the Zipper Worm Company, which mass produces machine-injected zipper worms. They are still so soft, slightly cheaper, more widely available than the Roboworms, and bass gobble ‘em down as greedily as they do the Roboworms. 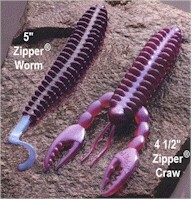 Since then, several other companies, especially Western specialty shops, have introduced zipper style worms too. Basic Anatomy. Now a zipper worm is a flat, wide, bulky worm. It has stubby rib-like protuberances all along both sides, hence the name Zipper. It is often thicker around the edges and can have a kind of sucked-in, thin center of the body, depending on manufacturer. But all have a signature broad pennant-shaped silhouette, which gives the lure lots of fish appeal. You can rig it vertically, whereby people say the pennant shape appears minnow-like, or you can rig it horizontally whereby people say the pennant shape presents a crayfish silhouette to the fish. Suspended and Deep Bass. The Western pros have been using zipper-style worms effectively as finesse baits by shaking, doodling, splitshotting, hovering or using other tactics for fish suspended in mid-water or right over deep bottom. Often a light weight Carolina or Texas rig with brass & glass or an open hook darter jig is used on thin line for suspended and deep fish. The lure is often kept dancing with rod tip motion, including frequent pauses. The lure's bulk and ribs create a lot of water displacement. The softness of the lure generates body flex as the rod is worked. After a few seconds of rod tip movement, let the lure come to rest for a few more seconds, and expect the resting lure to get bit. A fish will often only feel like a slight pressure or movement in the line, and sometimes you don't even know one is on until you go to shake the rod tip again. Flippin' and Zippin'. Zipper style worms are also being used on Texas rigs for flipping light to moderate cover, but you will go through lots of them as they get torn easily by the bass and by the cover. In general, you would not want to rig zipper-style worms on flipping jig heads like you can do with other soft plastics such as curly tail and spider grubs. Although wide-bodied, there is often very little plastic going down through the flat spine area of a zipper lure where you would need to thread the entire jig hook. The first nasty bass you catch would rip the hook right out. Also, most zipper-style worms have the tiniest "pin heads" up front where you would need to slip it over a jig collar. For these same reasons, they do not make the most convenient jig trailers in the world either. They excel when rigged on those specially-designed, streamlined jig heads that have an offset bend jig hook shank and no jig collar. This style of offset hook jig is designed expressly for use with soft plastics. Just use a shot of super glue to hold the lure head securely in place. Weightless rig with an offset hook for keeping the bait up on top like a topwater lure, or for letting the lure glide around and drift motionless below the surface. With any of the four rigging options above, you can rig the hook point Tex-posed in the bait's central body core and you will be well-protected from snags. Just make sure the lure body lies naturally straight with a little slack give in the rigged body, never stretched tightly on the hook. Relative to other soft plastics like worms and grubs, the lack of plastic in the head and center of the zipper lure becomes an advantage when setting the hook. There is very little plastic for the offset hook to go through when setting the hook with a zipper style worm! If you are a guy who fishes in tournaments, a club, or with competitive, experienced bassers, then you may want to try to get a few of the Roboworm or original Zipper Worm Co. lures before the other guys do! If you live outside California, it is a safe bet you'll be the first one to show them to the bass on your lake. My favorite model is the original 5" bait in either black w/blue tail, tequila sunrise (black/purple) or watermelon pepper. Keep in mind, even the mass-produced Zipper Worm Company lures are expensive, at about $4.50 per 8 pieces. If you are a beginning angler or on a budget, these may not really be the best buys for you. A few other manufacturers are now making their own varieties of generic zipper worms and some of these may be more economical for you. Exude Me Please! And as far as a 4" lure goes, Mister Twister's new EXUDE Fry is one of the best straight-tailed zipper styles made so far. You really owe it to yourself to try this one. Take a look at the pictures of it at the top of this page. It's features are designed to trigger strikes as the bait falls, which is when most bass hit. Observe the overall fish-shaped profile that bass recognize instinctively, including the fish-shaped head. The head is wide and intentionally designed to give anglers the correct amount of plastic to hold the lure well on an offset hook. The body has a super-thin central core spine that runs along its length, and some of the biggest, softest protruding ribs of all zipper-style lures hang off this spine. The bigger ribs cause it to drop slowly and erratically with plenty of water displacement. The ribs generate a vibrant feeling which fish sense in their lateral lines. The ribs are so wide, you can rig the hook point Tex-posed so it comes out of the side of the body and the Fry ribs will help protect the hook from snags. The ribs on many other brands of zipper-style worms do not enable you to fish a Tex-posed hook point nearly as well. As for softness, the whole lure is so soft it is ridiculous. As if that wasn't enough, the plastic exudes a slippery coat of fish-attracting slime when wet. It is such a well-designed lure! I am curious to see what kind of success this new bait achieves during the 1999 season. You can buy the EXUDE Fry online at MisterTwister.com. Try the red shad (black/red) color any time and any where. Use the smoke with blue/silver flakes in clear water, and try the chartreuse pepper in spring and fall, when the water temperatures are cool and bass are aggressively feeding. Shake 'n Bake. Out West, a technique called shaking was popularized some years ago for finessing suspended, inactive bass in clear open water. My partner Eto and I took this technique, combined it with skipping, and modified it to shake and bake shallow bass out from under shade trees, bushes, docks and other hard-to-reach, relatively weedless shallow cover in 1 or 2 feet of water. Years ago, we pioneered the shake 'n bake with 3" Kalin's grubs on 1/32 oz. exposed hook jigs on the thinnest diameter 8 lb. test line we could find. We modified the basic technique for various lures since then - tubes on wireguard jigheads, Texas-rigged ribbon tail worms, weedless jig spider grubs, etc. Last year, we began to apply this technique to zipper style worms on Berkley Ultra Thin 10 pound test using 1/16 oz. offset style jig hooks such as Charlie Brewer's light wire Snagless Slider Head (item # WSH16) and the 1/16 oz. "T.R. Lead Head" from Bobby Garland. We also use 12 lb. test and the 1/8 oz. jigs when the water is 2 to 4 feet deep right against shore, usually alternating between two rods. By far, the ultimate rod for this is the Lamiglas Certified Pro Graphite model #664 which comes in both spinning and baitcasting versions. We always rig the zippers flat for this. It helps with the skipping and the erratic action as the lure drops and darts underwater. With the wide-ribbed zipper style worms, you can lightly embed the hook point in the plastic spine so it is nestled amidst the ribs. You get a great hookset that way. We bag a lot of inactive fish holed up during the heat of the day under shade trees, bushes and rocks extending out from shore. We skip the zippers back under the trees, bushes or docks, usually hoping to reach the shoreline. Blast them back there as far, as hard, and as fast as you can, and don't worry about all the splashing the lure makes. Contrary to what you may read elsewhere, bass like it! If you don't know what an inactive fish is actually doing under there, it is in an oblivious stupor and only hazily aware of what's going on around it, including your lure. Sometimes there are rocks or broken branches under there - bass key off this, so your zipper has to be placed near it. These bass are inactive, they nestle into depressions right next to and under the rocks, and under the branches. This provides them with a feeling of security during the zoned-out state they are in. They absolutely will not swim out of their rock or branch tangle to get your lure. So the zipper must settle on the bottom in the best possible spot, like right in front of the fish's mouth. You will get many bites on the initial entry and settling of the zipper. So, watch the line as it floats on the surface after the lure settles. Look for the line to jump, or start shooting out rapidly. If this doesn’t happen, then slowly wind in a little slack. Don’t move the lure, just “feel” if the zipper is still where you think it should be. Remember where it settled into the water? Is it still there, or is it a few feet away from where you expected it to be? If so, a bass is moving off with your bait. If not, let the zipper just lie there for 10 seconds and exude the fish attractant you are frequently splashing on it. There's a good chance a bass has it's nose right behind your lure's tail. Or a bass is sitting within inches of your lure, in a stupor of inactivity. This is one situation where scent and time are on your side. Now, bring in slack without moving the lure, then raise the rod tip so you pick all the floating line up off the surface of the water, still without moving the jig. Now start shaking the rod rapidly with the tip between 10 and 11 o’clock or so. What you want is a little belly in your line and you want the line to wave up and down between the rod tip and the spot where the line enters the water. The whole effect should have the arc of the line following a perfect elliptical pattern in the air. This can be described somewhat like, if kids are jumping rope, where two kids each hold one end of a long rope, for a third kid to jump in the middle. Well, picture the ellipse shape of the rope at its highest point and lowest point - this is the pattern you want your line to throw at its highest and lowest point in the air as you shake it. You still haven’t moved the jig forward at all. Shake 5 to 10 seconds, then “bake” - just stop abruptly and let the line float back down and rest on the surface and watch it again like a hawk, because you can expect to be bit right NOW. If not, wait 10 seconds, shake again, bake, then shake and bake some more. What are we trying to accomplish here? Think of how you are shaking the lure, and think of all the vibrations being given off from a zipper-style worms ribs as you do that. Think of your lure as a noisy alarm clock going off in a sleeping fish's face. What would you do if an alarm clock kept going off in your face every 10 seconds? You would probably reach over and silence it in order to have it stop bothering you, right? Get it? Never crawl it forward. If you do, you will lose the fish's attention. After you have shaked and baked for a minute or two, swim the zipper slowly away for a few feet, then zip it back in and fire off a few more casts. Really saturate a spot before giving up on it. Trust me, they are under there!